“The new norm looks like there’s a disaster a week,” says Pastor Mike Hayes, overseeing an effort to help churches in Houston, Florida and California. 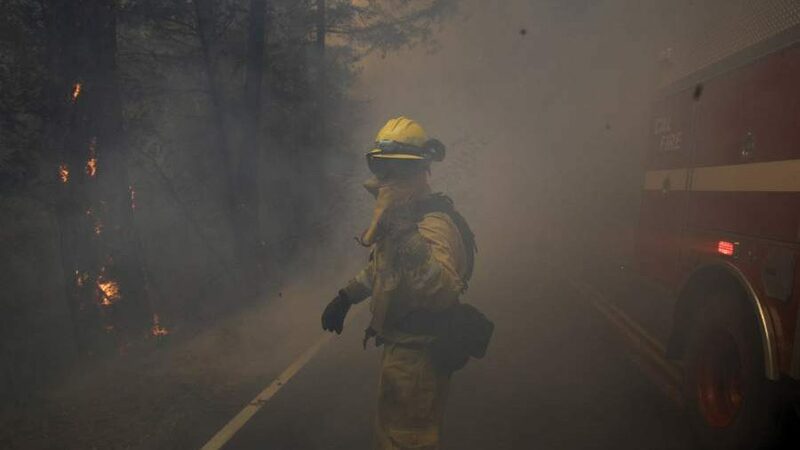 firefighter gestures to his colleagues as he walks through thick smoke from a wildfire Thursday, Oct. 12, 2017, near Calistoga, Calif.
Then Hurricane Irma rocked Florida, and Hurricane Maria devastated Puerto Rico. Currently, wildfires are raging across California. Yet one pastor who heads up a national network of evangelical churches says there is hope in the crisis. Longtime Texas pastor Mike Hayes has seen the crisis in Houston firsthand. In an interview before Values Voter Summit in Washington, D.C., he shares how believers are working together to rebuild cities and restore lives. Josh Shepherd: Tell us about the crisis you’re seeing — the devastation in Houston and Florida, as well as the fires raging in California right now. Mike Hayes: I don’t know that in my lifetime we’ve seen this kind of crisis. Houston, the fourth largest city in America, was almost totally underwater. It is going to take years for them to recover from. Then Florida was majorly hit. It seemed like there was a hurricane coming ashore every week. Now we have some of the most devastating fires in northern California. I talked to one of my wife’s relatives recently who is in the business of providing shower facilities on-site for firemen. He said, We have 72 fires burning out of control all over the West. They’ve just reached northern California — Napa Valley and Sonoma, some of the most beautiful places in the world. More than 20 people have lost their lives, and another 200+ are missing. Over 3,500 businesses and homes have been burned, and the fire is still mostly uncontrolled. JS: Why are you focusing your efforts to especially help local churches? MH: Think back to Hurricane Katrina in Louisiana. New Orleans lost more than 40 percent of its churches. A lot of them were minority churches in urban areas. When a church disappears from a city, the community suffers. Churches are a hub of social bonding and support services. After the hurricane, they closed their doors and never reopened. When Harvey made landfall in Houston, we couldn’t let that happen. We specifically started raising money to help and get people on the scene. My adult son Stephen took my bass boat, traveled to Houston and starting rescuing people alongside other pastors. They were in the middle of it. I began challenging pastors I knew across the nation to help in this crisis. They responded and through HelpChurches.org we raised $1 million dollars in a matter of days. As part of our Churches in Covenant network, we designated some pastors in the south Texas region to vet other pastors, find out their needs and get them back on their feet. If you help a pastor, he can help his church. And when you help a church, you help a whole community. Our goal was to get pastors and their families back in their homes. Let’s get their church dried out, returning to worship services and become a volunteer touch point to help the community. JS: Where are you seeing hope in the midst of the crisis? MH: We’re still working in Houston and in Florida. Then the fires started in northern California. Two nights ago, I reached out to a pastor friend we know there. He said, We are evacuating as we speak. My sister’s house is burned to the ground and the homes of 30 families are gone. The fire is a half-mile from our church. He asked: Please pray — if the winds don’t shift, we’re going to lose our church and home by midnight. I put it on our prayer list, with 350,000 praying all over the world. The winds did shift. The next morning, the winds turned east and his church and house were spared. The whole city of Santa Rosa is calling it a miracle! It’s one of the most unchurched cities in America, and now we’re helping those pastors. The new norm looks like there’s a disaster a week. Out of these crises, we opened HelpChurches.org as a hub for people we were calling personally. All of the money goes right to the need. It is all properly vetted. It’s taken on a life of its own as people want to give where they know funds are going to a good cause. JS: Tell us about the Center for National Renewal and your background in ministry. MH: After 40 years pastoring a church that Kathy and I founded in 1976 in the Dallas area, we transitioned Covenant Church last October to our son Stephen who is the senior pastor there now. Kathy and I came to Washington, D.C. to open the Center for National Renewal. This is a touch point for Churches in Covenant, a network of about 50 churches across the nation. We are now working on four specific parts of a vision God gave us. It includes intercession, reconciliation, education and influence. I’ll tell you just one thing about the second part of the vision. We’ve been involved in racial reconciliation for 30+ years in a multiethnic church. Two weeks ago, I was at The King Center filming a program. I was asked, Dr. King was assassinated in 1968 and we thought so much changed. Why are we back here again? In the 60’s and 70’s, the church did not deal it with and there was no spiritual solution found. The church rejected Dr. King’s message. Politicians embraced Dr. King; in some ways, they co-opted his message. The civil changes we saw were good, with schools, workplaces and the military integrated. The church stayed largely unfazed. In certain moments, we see God provide grace as crisis is revealed. God is aware of issues in our lives that were there all along, but now you’ve got the strength to deal with it. I believe God is allowing this racial division to the float to the surface again. He trusts that this time there is a mature enough body of Christ to deal with it. JS: What do you say to Christians who dismiss efforts to speak out on racial justice issues? MH: This is one of the things I think about day and night. So many people are tired of talking about race relations. They think, Only a few radicals care about this. What more can we do? We’ve done enough. A word came to me in that interview at The King Center. Rev. Samuel Rodriguez asked me, “Why are so many Christians ‘good people’ but this issue isn’t changing?” I traced back the steps of my own story. My parents weren’t raised Christians and we had racism in our family. The first thing that happened to me when God broke my heart about this issue was that I loved everyone. When I realized that I was not a hater, I thought that was enough. I think about 100 million Christians are right there. I don’t hate anybody, they think sincerely. But God calls us to be healers. It’s not enough that I don’t hate others of other races. We have to do something to heal the rift between us and other races. JS: Why is it important to help churches right now? MH: There are many groups doing good work right now. We interface all the time with Convoy of Hope, Samaritan’s Purse and others. Our effort at HelpChurches.org is focused specifically on churches in areas of disaster. Even the President himself said, The church is the greatest volunteer center that we have ready to go. But when a church is flooded out or burned down, there’s nowhere for that to happen in a community. When you save a pastor, it saves a church. And that helps save a city. What did King David say when a man wanted to give him that threshing floor to use for sacrifices? He said that he would not offer a sacrifice that cost him nothing. You should be doing these things and doing them from YOUR OWN wealth, not somebody else’s. If I understand Tim Pan correctly, ‘Use Harveys money’ is in reference to all the tax dollars being used for hurricane Harvey relief. That would include my own wealth, in fact I’ll be paying for it for the rest of my life since the govt refuses to balance its budget. It is, however, also using other people’s money. Yes indeed, couldn’t agree more. I’d prefer the govt stay out of the charity business.